Nick Jonas talks about the bond Priyanka Chopra shares with Sophie Turner and Daniella Jonas. Priyanka Chopra is often spotted having a ball with her in-laws Sophie Turner and Danielle Jonas. 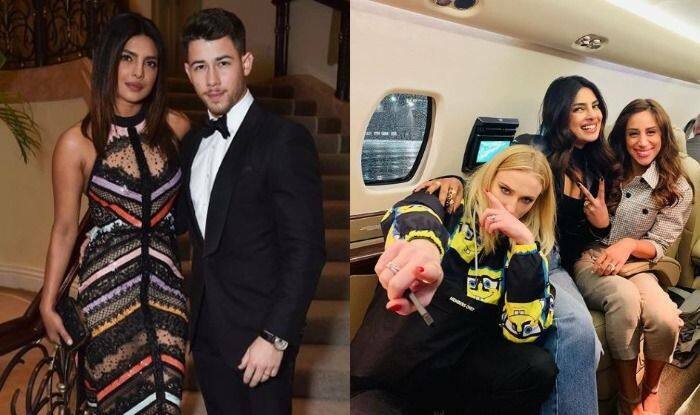 In fact, the three even featured on the Jonas Brothers’ single ‘Sucker.’ The share a great bond and recently PeeCee’s husband Nick Jonas talked about the same and said that it is “kind of a dream” that his wife Priyanka Chopra, Sophie Turner and Danielle Jonas are “so connected”. In an interview to Entertainment Tonight, Nick opened up about the close friendship that has formed between Priyanka and his brother Joe’s fiancee Turner. “It’s a great feeling. I mean, it’s kind of a dream where, as close as we are as brothers, that our wives and fiance are so connected as well,” Nick said. The ‘Chains’ singer admitted that reforming the Jonas Brothers band was “obviously a huge adjustment for everybody”, but they have gotten nothing but love and support from their significant others, including Kevin Jonas’ wife Danielle. “To get to share that with them is a really amazing thing,” Nick added. Talking about bonding with Priyanka’s family, Nick said, “It is one of the things we were so drawn to about each other. And the family’s just getting bigger and bigger, and that’s a beautiful thing. “We love including our loved ones, our family, in everything we do…our house is for everyone, our doors are always open. That is, in my opinion, how it should be,” Nick added. Priyanka and Nick tied the knot in Jodhpur’s Umaid Bhawan Palace on December 1 and 2 in Christian and Hindu ceremonies. Post that, the couple has been getting some major couple goals.